Holy cow, a family of six can eat a lot. Our grocery bill has increased dramatically in the last year, and I feel like food and meal prep takes a large part of my time. But I love cooking! This is a fun one! I can keep it simple for the kids and use up all kinds of random veggies and cheeses on the grown-up one. I’ve been using the herb pizza dough from Trader Joe’s or homemade with this quick-ish recipe. Below is a pre-made crust that I used for Cora’s cook night to make it really easy. Not as pretty as the original recipe of course but tasty! I’m trying more plant-heavy and vegan recipes. This sounded intriguing and was surprisingly tasty! My Inspiralizer has been a fun way to be creative with veggies. These sweet potato “noodles” were a good base for this chicken (inspired by this recipe) which I simplified by sautéing chicken breasts then covering with cooked spinach and a slice of provolone then baking until the cheese was melted. This one is potatoes and goat cheese. Would have been sooooo good if I’d had bacon. I grew something!!! This is amazing!! I’ve failed repeatedly at gardening (and even keeping houseplants alive), so it was shocking that the shishito pepper plants I grew in containers thrived this year! We can eat a lot of these grilled. Tomatoes and kale are from my mom’s much more successful garden. Turkey burger topped with tomatoes and avocado, packet-grilled potatoes, roasted broccoli, and kale salad with cashews and oranges. This time artichoke hearts and mushrooms. I got a pizza pan this year and love how it makes the crust. I could seriously eat grilled shishito peppers every day. Plus quinoa salad and a creamy cabbage that wasn’t awesome. Spiralized zucchini with homemade meat sauce and my attempt at green beans with almonds. The kids ate green beans at a neighbor’s house for an emergency dinner when we had to take Grant to the ER, and they proclaimed these delicious. Of course, when I made it, they didn’t feel that way. Everything’s better at other people’s houses, haha. I tell the kids they can pick whatever they want for me to make on their birthdays. Hannah picked homemade cinnamon rolls. Smart girl. They’re so much work (I think I clocked five hours). but they make a lot and are truly delicious. I use the Pioneer Woman’s recipe. This was a quick and easy meal! Rice cooked while I was sautéing the shrimp, and that’s the Asian salad kit from Aldi. And cold weather is here. This is Brett’s favorite soup of all time (I’ve been making it since 2009 and blogged about it in 2011), and he requests it often. So there are a dozen things I’ve made and remembered to photograph. Do my kids happily eat all these veggies? No. But this is what I serve, and we obviously eat plenty of pizza to balance it out, haha. What have you made recently? I’m always looking for ideas! Reading is always a good idea. But in the busy-ness of life, it often gets pushed to luxury status. I’ve got too much “important” stuff to do, too many “real” issues to deal with. And when I do sit down to read, I’ve got a mission: solve a problem. My TBR (to be read) list has grown remarkably over the last year – as parenting issues and ADHD have moved to the forefront of my mind, my bookshelf reflects my real-life stresses. For the last year, you could always find me with nonfiction, delving further into our reality and attempting to learn and apply. I didn’t know I needed an intervention. 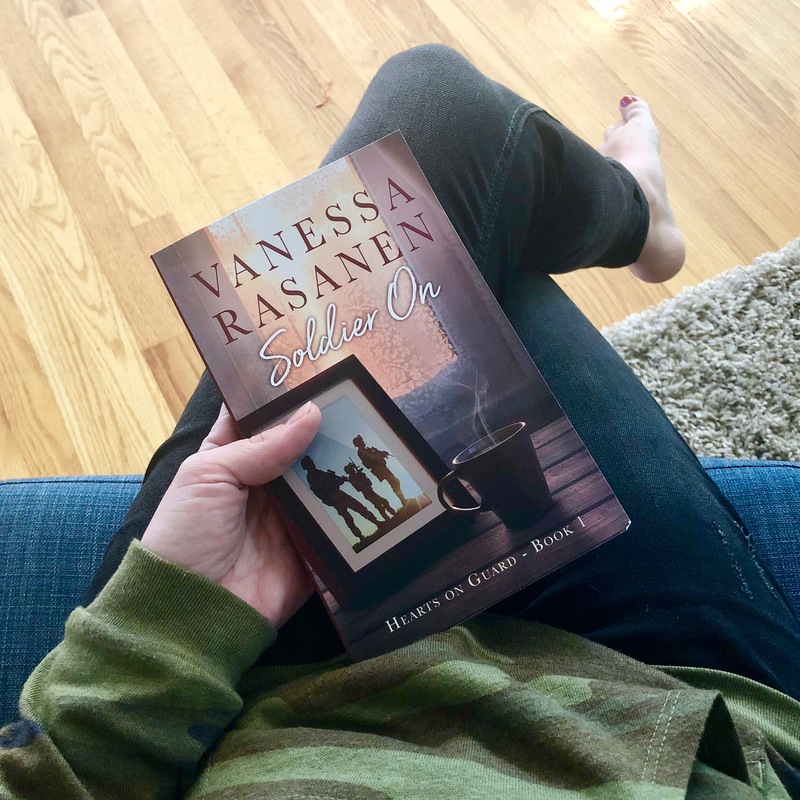 For the past few years, my friend-since-middle-school Vanessa Rasanen has been working on a novel. I’ve watched her wrestle with the plotlines, create these characters, and change her entire schedule to write more. So when her “baby” was finally born, I couldn’t wait to get my hands on it. Turns out, it was exactly what I needed. Instead of being caught up into my own reality, I was transported into the lives of a military couple as they navigated another deployment, personal tragedy, and a crisis of faith. I couldn’t put it down! Vanessa has the gumption to tackle reality without sensationalism. She artfully weaves real-life issues in the storyline with humor and authenticity in Soldier On. The characters leap off the page, so I felt like I was curled up eavesdropping on two friends or choking dust and bad coffee alongside the troops. My return to fiction is a welcome respite from daily life, even if it involves explosive devices and weighty secrets. Especially if it involves humor and coffee. 2oz Rainy Day soy candle from Mitten Candle Co.
Visit the Rafflecopter link for all the info! And check out some other blogs featuring Soldier On and more chances to win! There’s nothing unusual about me meal-planning, but one week I had an undercover theme. All my dinner plans had something in common. Or rather lacked something in common. Meatless Mondays are trendy, and our family already lands way below the national average for meat consumption. But I wanted to put myself and my family to the test and see if I could cook family-pleasing vegetarian meals all week. I have vegetarian, vegan, and reducitarian (love that word) friends, so cooking meatless is hardly an innovative concept to many who might be reading, but I wanted to do this to encourage families who might think this isn’t possible or who want to cut back on meat for health, budget, or treatment reasons and think their families will protest. Maybe they won’t notice. Mine didn’t. These are homemade roasted potato wedges that everyone got to top with their choices. I did sautéed peppers and onions, pickled jalapeños, cheese, and sour cream. Sour cream doesn’t photograph well as it knocks off the color balance, lesson learned. These were my personal favorite of the week. I loving using Trader Joe’s Wheat & Corn tortillas for enchiladas because they don’t crack apart like corn tortillas but have a better texture than straight flour tortillas. I roughly adapted this from my go-to enchilada recipe from Good Cheap Eats – used roasted diced sweet potatoes, black beans, and pepper jack cheese. Hit the spot on a cold, rainy night, though the kids thought the sauce was too spicy. No objection to the weird filling, just the heat level, haha. Did you know Aldi carries a lot of vegetarian and vegan products? Their meatless Italian Sausage is quite tasty, with good texture and flavor. I have one girl who won’t eat sausage, but I get some protein in her by whispering to her that it’s not actually sausage. ;) This was probably the kids’ favorite. I added diced tomatoes, butternut squash, spinach, and basil. Served with Caesar salad mix. This was the only one this week that I actually used a recipe. (I’m not a great food blogger, and this post is intended more for inspiration than instruction) Thai Pra Ram Tofu was Brett’s favorite of the week. It was easy to make, and my kids like Thai dishes with peanut butter. Served with Thai cucumber salad, brown rice, and broccoli. This was a gamble for me because my kids didn’t like any recipe with spaghetti squash last year. But this was a good start to fall squash season 2018! I think I won them over with the black olives. Served with garlic bread. I used my usual recipe for spaghetti casserole and just substituted cooked spaghetti squash. Are we turning vegetarian? No. But this week showed me it’s not as hard as I thought to come up with meatless meals, and they were better-received than expected by the five other mouths I feed. There are a lot of benefits to cutting back on meat consumption. Budget is a good place to start. Health is another one as meatless meals have more vegetable servings. Very few people get the recommended daily amount, and this is an easy way to get more. Meatless Mondays are a great place to start as a mindful way to introduce change. And I admit I’ve gotten in a rut! This was a great way to find some new recipes and experiment with new family-friendly meals. What are your favorite meatless meals? Y’all know I love Aldi. It saved our grocery budget, and my comparison shopping with favorites is my top post on the blog. Buuuuut, one of Aldi’s main benefits is also a downside. I love that the choices are minimal, and I can shop quickly and easily with no decision fatigue. However, there are a few items that I found myself missing. On a recent trip to Hy-Vee (more on that later), I took the chance to stock up on some of my necessities that I can’t buy at Aldi. Whole wheat pasta – Aldi just started offering ww spaghetti, but for more choices I have to look elsewhere. Wheat buns – This is only a summer seasonal item at Aldi. Unbleached flour – I use both white whole wheat flour from Trader Joe’s and unbleached flour. Aldi only sells bleached. Poblanos (in bag) – Chile rellenos are on the menu, and Aldi can’t hook me up. Uncured bacon – Other stores are often cheaper than Aldi’s price on uncured, nitrate-free bacon, so I stock up and throw it in the freezer. Petite diced tomatoes – These are my preferred style of canned tomatoes, and sadly Aldi no longer carries them. Squeezable jelly – This is a necessity with my independent PBJ-makers. I buy the reduced sugar kind. Hiding under the bacon, you can see what prompted my trip to Hy-Vee. BudgetBytes recently posted the tip on her Instastories about getting homemade pizza toppings from a salad bar. So I picked up a little bit of a few things, and Brett and I will enjoy some mushroom, bacon, and artichoke pizza while the kids chow down on their black olive pie. Easy way to get a little bit of several things! My Aldi love isn’t going to fade any time soon, especially since they’re currently remodeling mine, but I do have to be strategic in buying some of my necessities when I get the opportunity. Worth it! If you’re a major Aldi fan like me, what are some of the things you have to find elsewhere? Just reading it on the menu transported me back 17 years. I sat up on my bedroll in the hostel and glanced at my watch. After a long day sightseeing in the Japanese countryside, our last day, I’d slept through dinner. My stomach told me this was not a good situation. Luckily, when I connected with the rest of my group downstairs (and yelled at my brother for not waking me up), I found a contingent walking to a convenience store, and I tagged along hoping to find something edible. I pictured the greasy rotating hot dogs at 7-11 and a bag of chips, but I was so hungry that I’d settle for anything. I should have known better. Food is different in Japan. 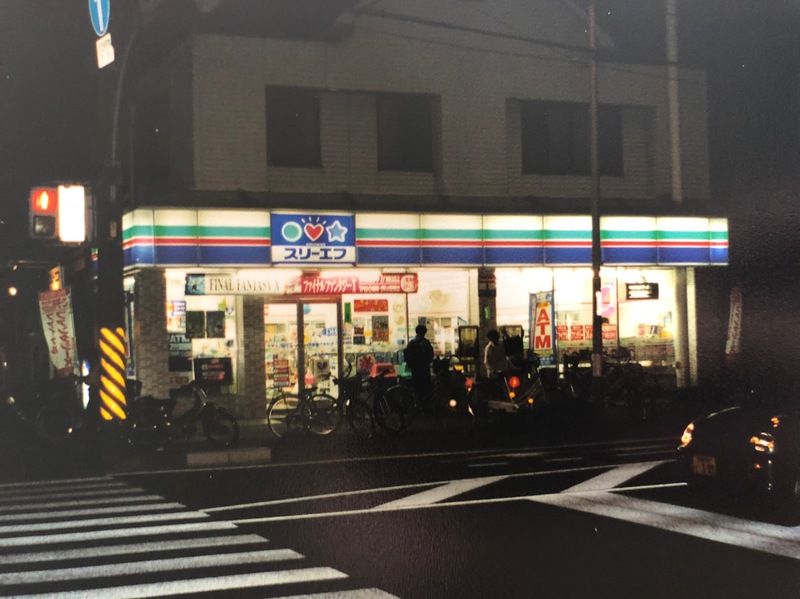 The convenience store offered an array of healthy prepared foods. I wanted something simple but filling, so I selected some cold soba noodles. Soba noodles are thin buckwheat noodles and can be eaten hot or cold. These came with a sauce and sesame seeds. We walked back from the convenience store in the dark. I was so hungry. I plopped down on the tatami mat, cracked the chopsticks open, and shoveled cold dark noodles into my mouth. 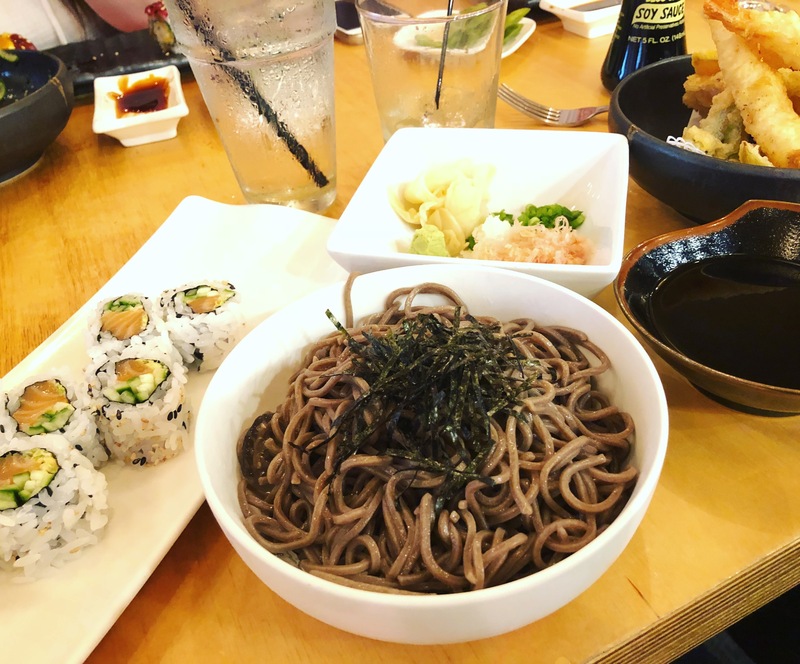 As elevated as the Japanese are about food, they are not so particular about table manners, so my noodle consumption style was entirely appropriate. In that moment, I hadn’t tasted anything so good. I was still sad about leaving a country I now loved, and nervous about the travel the next day, but at least my tummy was happy. It’s amazing how a food can conjure up such vivid memories. It’s not just about the physical taste – it’s the experience, the atmosphere, the company. This bowl of soba had much nicer presentation than a plastic container from a convenience store. I also had some spicy salmon rolls and veggie tempura to round out the meal. The food and the company were wonderful. A comfort food with some of my favorite people. A flood of memories from a favorite place. My little Peanut is having surgery. After many minor issues over the last year, she’s getting her tonsils and adenoids removed. While she is fairly oblivious to the impending situation, the other girls have had friends go through the same thing and are both stressed about her going through surgery and also excited to take part of the special foods that are encouraged during recovery. Last weekend, I added these special soft foods to my grocery list at Aldi. I stood in the snack aisle thinking about what fun it would be to buy these things for my girls. 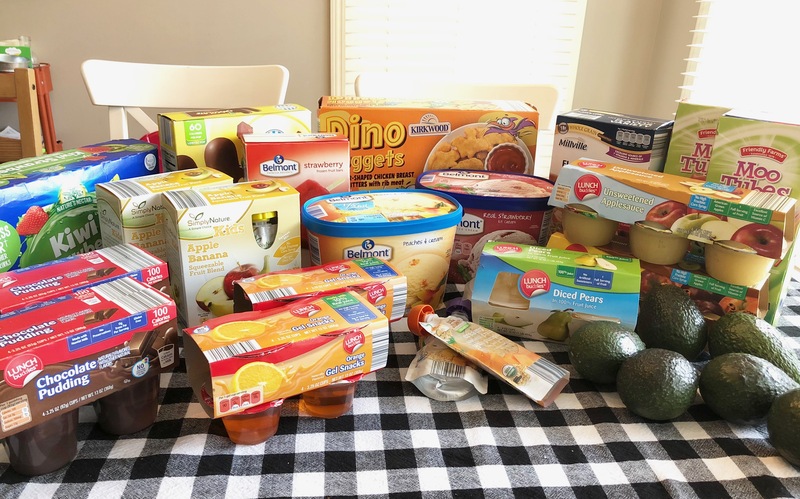 Jello cups, pudding cups, fruit cups, flavored oatmeal packets – never on my normal list, so I excitedly grabbed multiples of things, glad that there was something for the girls to look forward to. I’ll give her a momentary benefit of the doubt. Maybe she wasn’t talking about me. Maybe she hadn’t even noticed me and my cart full of pudding. But it sure seemed like weird timing to make a random declaration of personal buying habits. I was immediately defensive. Food is important to me, and the way I feed my family is very important to me. I spend a lot of time and effort making meal plans and encouraging healthy eating habits. I want to look right. Then felt convicted. While I definitely wouldn’t have said it out loud, if I had been in that woman’s shoes observing my sugar-filled, pre-packaged snack binge, I would have thought the same thing. Food is important to me, but it shouldn’t be a source of self-righteous pride. 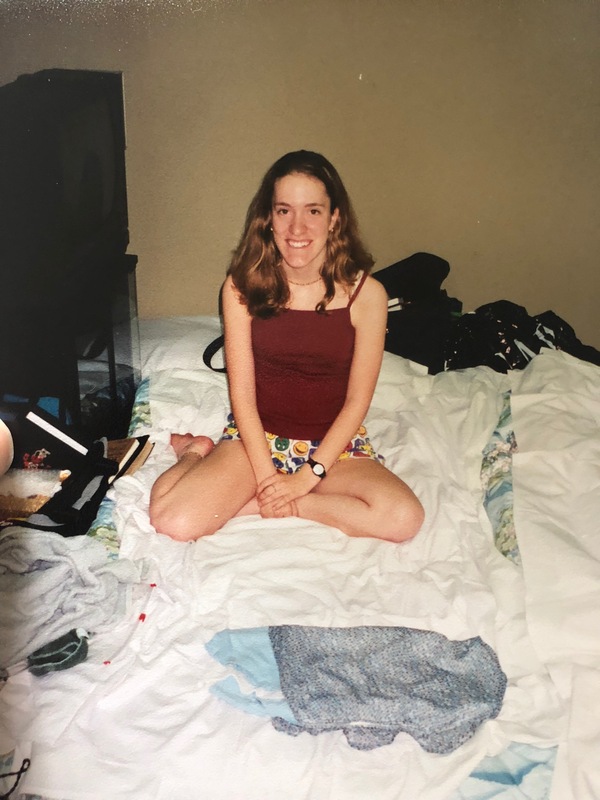 I wanted to launch in and set her straight – provide an extensive explanation of what was happening in our family and justification about why those particular items were on my shopping list this week only. Her speck of a rude comment certainly illuminated the plank of food pride in my own eye. Instead of looking at other’s carts, I’m going to practice Ecclesiastes 9:7. “Go, eat your food with gladness, and drink your wine with a joyful heart, for God has already approved what you do.” Because I really wanted wine after that. I shouldn’t feed my kids a certain way for my own glory. So I can post a nice pic on Instagram. It’s for the glory of God, fueling their bodies to grow and serve Him. It also showed me the lesson that a snapshot of a person’s life does not necessarily represent the whole. Yes, maybe a mom shoveling jello cups in her cart feeds her kids junk food every day. Or maybe she’s trying to entice her already-underweight kid to eat after surgery. So I finished shopping. Yogurt squeezers, popsicles, apple sauce, ice cream, avocados, and dino chicken nuggets filled the checkout belt. All Cora’s favorites and soft things. I’m going to get the plank out of my eye and go back to focusing on helping my kid heal. And I’m going to try not to care what the lady next to me at Aldi thinks about what’s in my cart.